One of the most significant roles of a leader is to manifest positive influence in his or her organization and in the lives of those they lead. This is done through maintaining credibility. Increased trust in a leader results in increased credibility. Therefore, when trust declines, a leader’s credibility account declines with it. Simple, right? Our credibly bank is not a locked down vault, deep in the basement, far away from the other areas of our lives. It is an account that others influence more than we would like to allow. It affects our view of others and how we act around them. 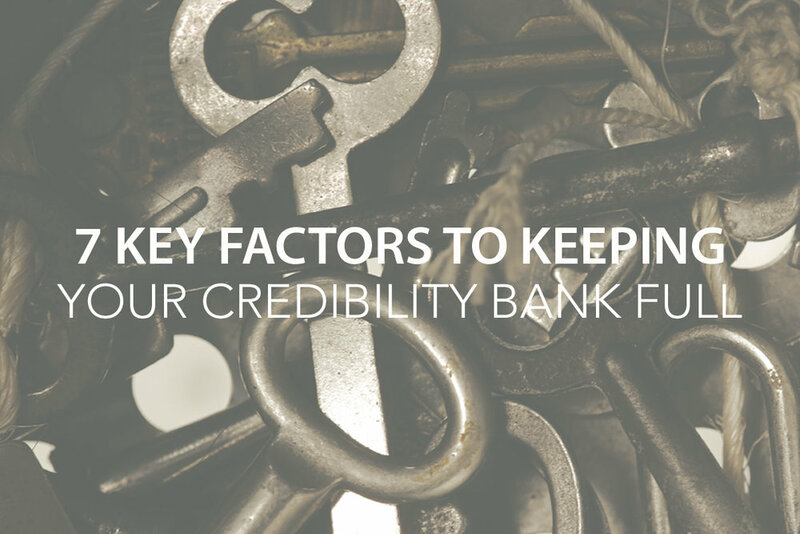 Since maintaining our credibility bank is so crucial in our relationships with others, it is important to understand how it works. Our credibility bank is continually active even before we establish a relationship with a person or group. For example, when being interviewed for a new position, our credibility bank is influenced by such things as our reputation, credentials, and who is recommending us. Our credibility bank belongs to us, but we don’t have complete control over it, unlike our financial accounts where others need our authorization to impact or even access them. Others can make deposits or withdrawals based on what they say to third parties about their relationships and interactions with us. Withdrawals (because of unfavorable behavior) are often greater in magnitude than deposits (for favorable behavior). Our mistakes or failures can potentially cost us more than we gain from successes. They say it takes 7-10 compliments to cancel out one insult. That is a lot of extra work. The mere perception of how much credibility we have influences interactions we have with others. For instance, whether or not a proposal we’re recommending gains support may hinge on how credible those considering it believe we are. We can overdraw our credibility account to the point where it’s next to impossible to restore. Bankruptcy has occurred: a situation so damaging that no amount of time or energy will likely restore it. Our credibility can become so inflated that we get away with inappropriate behavior or mediocre performance. An example is the dynamic leader who spends little time preparing for meetings because colleagues readily accept his ideas based upon previously earned credibility. Some things are worth losing our credibility for. Given the influence of pragmatism and utilitarianism in our society, we may resist sacrificing our credibility. However, core values drawn from the Bible should determine what is most important and what we should stand for, even at the cost of our credibility. Manage your leadership credibility. If you don’t, bankruptcy may be waiting in the shadows to claim another victim.